Here’s an easy Halloween craft to decorate your yard and greet all those trick-or-treaters as they come to the door. 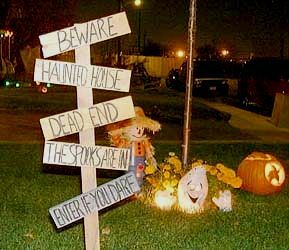 Use one of our suggested Halloween sayings, or make up your own to create these spooky Halloween yard signs! These sign posts are very easy to make and can be used for all kinds of holidays. This one is for Halloween. Begin by painting the sayings onto your signs with black paint. I used a wood burning tool first to engrave the wood, but this is optional. Come in for a spell. Park all brooms at the door. The older and more ugly your boards are, the better. If you want to preserve this project for several years, you should apply a coat of outdoor varnish to all wood surfaces when you are finished painting. I didn’t do this because my boards were fairly new and I’d like them to age a little first. I will apply varnish once the boards have aged a little more. Once your paint is dry, attach the boards to the stake with screws (be sure to use at least 2 screws per board or your boards will turn). That’s it.